Every well-equipped home wood shop starts out with a set of variable size drill bits. Over the years, woodworkers will accumulate a small collection of specialty bits for countersinking, angle drilling and even hole cutting. It is not unusual to find one or more speed bits among these specialty tools, including the versatile split-point bit. If you work with hardwoods and other rare and valuable woods, a split-point bit is essential to protect your investment. It is not unusual for a woodworker to have a collection of specialty bits. Every woodworker has used countless standard drill bits over the course of multiple projects, and for general construction, these bits should accommodate your needs. The shaft of the bit has two curving grooves, called spurs, that lift debris from the hole you are drilling. The tip of a standard bit is smooth, coming to a slight point, almost as if the bit tip is wearing a small, rounded cap. Unfortunately, unless your wood provides substantial friction and your drill is perfectly perpendicular to the surface, these smooth-cap points can slip off target and gouge your wood. This is called "walking." Falling into the speed bit category, split-point bits almost completely eliminate "walking." The shaft of a quality split-point bit features three grooves that lift away debris, allowing you to drill holes faster and with less chance of snags. These grooves continue all the way to the tip of the bit, where they cut into the tip's cap, breaking the smooth surface. This creates a grooved bit tip that more easily anchors itself in the wood and keeps your bit on target. 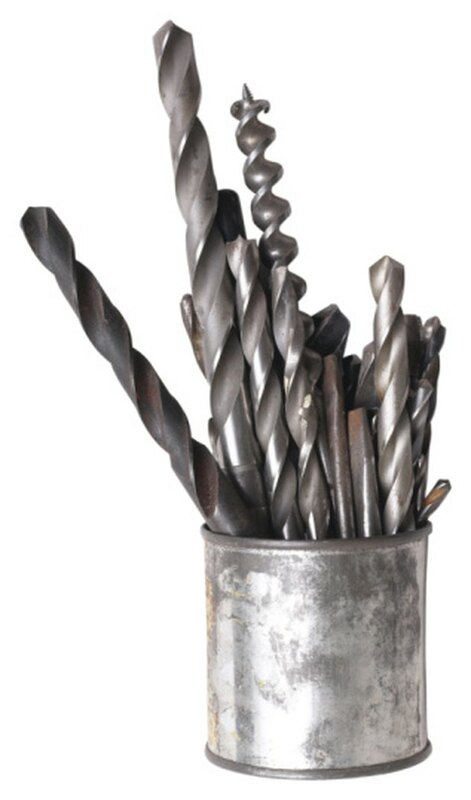 Many split-point drill bit manufacturers do not specifically mark their bits with the "split-point" designation. This can make these superior bits more difficult to find at your local hardware store or online. Determine if a bit is a split-point bit by closely examining either the image of the bit or the bit itself. The tip should never have an unbroken circular cap. The surface of the bit tip should appear cut into, creating a shape not unlike a pinwheel. If you cannot find a split-point drill bit in the size your project requires, consider using either a spade-point or screw-point drill bit rather than risking your wood to a standard bit. A spade-point bit has a flattened tip, shaped like a gardening spade with a pronounced spike on the end. No "walking" will occur when using a spade point, though the shaft of the bit has no spurs, so expect some snags where you need to manually clean debris out of the hole. Another alternative is a screw-tip bit, which will clear debris as efficiently as a split-point with its three shaft grooves. A sharp, screw-shaped tip on this bit eliminates "walking."